On Monday we wrote that Americans can’t afford a transportation bill that locks households into the expenses of car dependence. Yesterday the Center for Neighborhood Technology hammered the point home, releasing new data showing how communities are getting less and less affordable nationwide. Median housing costs, as reported by the US Census, have increased by nearly 37 percent nationwide, while the national median income has increased by approximately 22 percent. Average transportation costs in the geographies covered by both Indexes increased by more than 39 percent or $318 per month. CNT attributes the growing burden of these basic costs to development in “location inefficient” places, where households have no choice but to shell out for an expensive mode of transport — driving. The findings come amid a Republican-led effort to pass a highway-centric, sprawl-favoring transportation bill, and a presidential campaign season where candidates are tripping over themselves to pander about gas prices without stating the obvious: reducing car dependence saves money. CNT, a Chicago-based urban research think-tank, has long held that “affordability” shouldn’t be based on housing costs alone, but must incorporate transportation costs as well. Rather than following the conventional practice of dubbing housing affordable if it accounts for less than 30 percent of household income, CNT adds in transportation costs and sets the combined threshold at 45 percent, which changes the picture dramatically. The result busts the “drive-till-you-qualify” myth that has driven suburban sprawl for decades, because the money saved on housing is often wiped out — and then some — by the costs of a longer commute, especially when that commute is dependent upon — and therefore sensitive to — the price of gasoline. 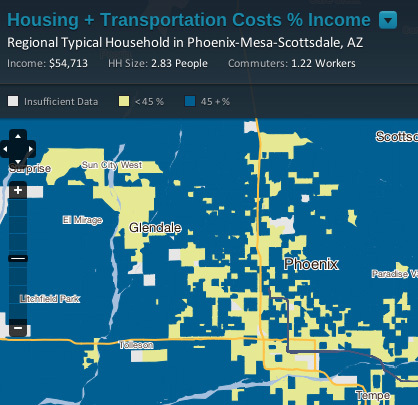 In addition to a new dataset, drawn from 2009 American Community Survey 5-year averages, CNT’s Housing+Transportation Affordability Index has received some slight cosmetic upgrades and added flexibility as a research tool. Planning professionals from San Francisco, Chicago, and Washington, who took part in a webinar that coincided with the official launch, touted its value to planning organizations big and small. Harriet Tregoning, director of planning for DC, said that CNT’s tools were especially useful in explaining the rationale behind her city’s “live-where-you-work” program, which encourages companies to provide assistance to employees who relocate closer to the company. Tregoning pointed out that affordability varies wildly within the District, and that only one third of District jobs are held by District residents, all of which can be handily displayed by CNT’s website. The site allows side-by-side comparisons of hundreds of metropolitan regions and thousands of neighborhoods, and can display statistics ranging from basic measures of housing and transportation affordability to greenhouse gas emissions and travel behavior. Thanks for sharing the info here, I think it is very useful for me and for people who are newbies here.